Jordan Gill will defend his WBA International featherweight title in Nottingham next month. Chatteris talent Gill, who has a perfect record of 23 wins from 23 fights, will box Enrique Tinoco at the Motorpoint Arena on May 10 on a live Sky Sports show. 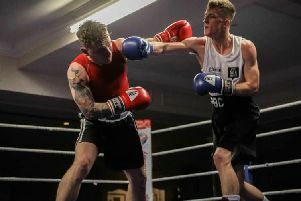 Gill broke into the WBA’s top 15 world rankings when he outclassed and stopped Mexico’s Emmanuel Dominguez in three rounds at the East of England Arena in Peterborough last month to win the International strap and is wasting no time in defending the crown. Tinoco is another tough Mexican with a record of 17 wins from 26 fights - 12 by knockout. “Getting out again so soon after my win in Peterborough is great for building the momentum,” said Gill. “I want to stay fresh in everyone’s minds and to keep on building and learning is important.